Think Before You Pink » Tomorrow is #GivingTuesday! Tomorrow is #GivingTuesday, and several our committed and generous members will match every dollar you donate to Breast Cancer Action up to $20,000. 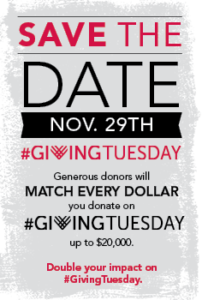 #GivingTuesday is a global day of giving back during the consumerism of the holiday season. We are a small organization and we raise a large portion of our funding during this time of the year. This is a great opportunity to double the impact of your donation. We refuse corporate funding from companies that profit from or contribute to breast cancer so that we can always put women’s health first. At Breast Cancer Action, we aren’t in the pocket of any industry. And this distinction makes all the difference in the world. Where we get our funding makes the difference between being an independent watchdog for women’s health—or just another mouthpiece for the breast cancer industry. On #GivingTuesday, several steadfast BCAction members will match every dollar you donate up to $20,000 so your gift will have double the impact. Please include Breast Cancer Action in your #GivingTuesday donations and help us raise $40,000 to fund our work to address and end the breast cancer epidemic. In fact, you can donate right now and your gift will be doubled. Thank you so much for supporting our work to achieve health justice for all women at risk of and living with breast cancer.